JetBlue has been in the news quite a bit lately, from its recent spat with Long Beach Airport to the impending clash with Southwest in Boston (not to mention the airline’s first-quarter profit). Now the low-cost carrier is making news in a more conventional way, by announcing service to a new destination. 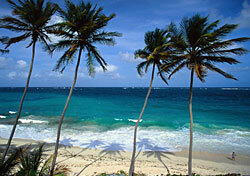 JetBlue will launch flights from New York (JFK) to Barbados on October 1. Fares are yet to be revealed. Barabados will join a growing number of Caribbean destinations for the airline, which is also adding service to Montego Bay, Jamaica, in May. However, Barbados represents something of a strategic change for JetBlue, as the island doesn’t exactly have a reputation for being a bargain. JetBlue’s other Caribbean destinations—Puerto Rico, the Dominican Republic, and Aruba—are a bit more deal-friendly. But as our own Christine Sarkis pointed out last month, even Barbados has seen some discounts lately. One has to think that JetBlue’s presence there will encourage more providers to target bargain hunters.